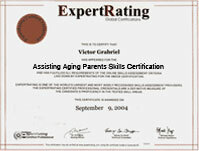 (leading to ExpertRating Helping Elderly Parents Skills Certification). You'll understand the impact of retirement, learn how to choose a nursing home, and be prepared to deal with death. You'll learn about financial and legal considerations, health issues, and family interpersonal relationships. You'll be introduced to special communication skills, observation methods, and coping mechanisms to ease the burden for everyone involved. You'll learn to handle most of the challenges you will face while coming to appreciate and cherish the privilege of the journey. About the Helping Elderly Parents instructor : Marsiea Warren has trained and coached people in the public and private sectors for over 25 years. She holds a Master's degree in Educational Leadership from the University of Alabama in Birmingham. She is a Certified Master Practitioner of Neurolinguistic Programming (NLP), and a Certified Clinical Hypnotherapist. This class is a labor of love springing from lessons she learned in helping her own parents through retirement, relocation, and her mother's illness and death. She has dealt personally with each topic in this course. Helping Elderly Parents requirements: For taking this instructor led Helping Elderly Parents you need Internet access, E-mail, and the Microsoft Internet Explorer or Mozilla Firefox Web browser. "An excellent course by a very gracious and compassionate instructor"
"An excellent course for me - it met my needs at this point in my life and I am so glad that I invested the time and money to take it. I have printed out the lessons and plan to follow up by reviewing material and consulting books and websites. I looked foreward to my weekly lessons, and I feel a sense of loss now that the class is over. Thank you!" "An excellent course for me - it met my needs at this point in my life and I am so glad that I invested the time and money to take it. I have printed out the lessons and plan to follow up by reviewing material and consulting books and websites. I looked forward to my weekly lessons, and I feel a sense of loss now that the class is over. Thank you!" "As I told others who have asked me about the course, you have dealt with all the issues in such a gentle way that it seems manageable and within the realm of possibility that I will be able to deal with this phase gracefully." "A very timely course in this day and age when the number of elderly is increasing at record levels. I had been searching for information on a variety of elder care issues for quite some time and this course provided me with answers to my questions in one place. With my parents entering their golden years, I needed a roadmap to guide me with helping them through the aging process. This course was that roadmap." "Dear Marsiea, I loved everything about this course. Not only was it helpful but very personal and interesting. I hope that you will be teaching other courses on line in the future. I look forward to advancing my education through you and the college. Thank-you for all your help." "Excellent and informative class. I only wish I had taken it several years earlier. Some problems dealing with my parents may have been avoided. I will use this material again and again. It's very valuable." "Excellent course, and it could not have come at a better time in my life. I feel I got an enormous amount of direction and information! I would highly recommend it to others!" "Excellent course! Highly recommend to anyone who has aging parents to help them through this process." "Excellent course, I gained so much from it." "EXCELLENT FOR ANYONE WITH AGING PARENTS, THIS IS A" MUST TAKE" COURSE.."
"Excellent source of information! Instructor was clear and easy to understand, lessons were to the point and illustrated the point perfectly." "For many, the journey down the path of Helping Elderly Parents is full of uncertainty and emotional highs and lows. This course lights the way for our journey through the experience of others. Knowing what to expect and being equipped with tools to handle the challenges along the way makes me more confident and better prepared to deal effectively with whatever lies ahead"
"For many, the journey down the path of Helping Elderly Parents is full of uncertainty and emotional highs and lows. This course lights the way for our journey through the experience of others. Knowing what to expect and being equipped with tools to handle the challenges along the way makes me more confident and better prepared to deal effectively with whatever lies ahead." "Great course to get a perspective on communicating and Helping Elderly Parents and dealing with the issues of nursing homes, wills, grief. Marsiea was excellent, not intimidating, very helpful." ExpertRating is one of the world's only ISO 9001:2015 Certified companies (from TUV America) offering an Online Helping Elderly Parents Course (leading to ExpertRating Helping Elderly Parents Skills Certification). When you choose the Helping Elderly Parents you can be sure that you are buying a premium International certification that is recognized by hundreds of employers and Government bodies in the US and other countries. With ExpertRating you get certified quickly online and you are equipped with a store house of information through the in-depth Helping Elderly Parents Courseware which has been developed by experienced Instructors. The ExpertRating Helping Elderly Parents Certification is by far the best value for money instructor led Helping Elderly Parents Program at $129.99. You can buy this Helping Elderly Parents leading to Helping Elderly Parents certification at a special offer price of only $129.99 which includes the in-depth Helping Elderly Parents Courseware and exam fee. This is the best value for money Helping Elderly Parents Program available till date. You get the following services within the USD $129.99 fee. In-depth Helping Elderly Parents Courseware including scenarios and case studies. World wide airmail delivery of the hard copy Helping Elderly Parents Certificate. The Helping Elderly Parents Certificate can be used to prove your certified status and does not mention the words "online". The process of getting yourself certified is very simple. All you have to do is buy the Helping Elderly Parents for $129.99. Log in to the instructor led course using your password. Go through the Helping Elderly Parents Courseware (which would take you 6 weeks) and complete the final Helping Elderly Parents Certification exam at your convenience. You can complete the exam within 2 months of buying the Helping Elderly Parents Certification. The result of the exam appears as soon as it is completed, and your Helping Elderly Parents Certificate is mailed immediately. Chapter assignments to help you practically use the Helping Elderly Parents that you will learn during the Helping Elderly Parents Course. The final exam is fully based upon the Helping Elderly Parents Courseware that is provided along with the Helping Elderly Parents Certification. If you have gone through the courseware properly you should not have a problem clearing the exam. The exam consists of multiple choice questions from all chapters of the Helping Elderly Parents Courseware. 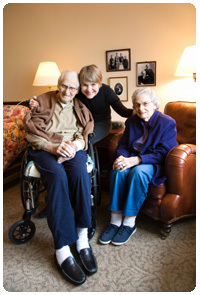 There is help at hand if you are an aging parent or an overwhelmed child of an aging parent/s. Helping Elderly Parents course is the right one for you if you are missing out on the quality of life and are reeling under the pressure of managing work, children, household chores and taking care of aging parents. This course will guide you on coping up with physical and emotional problems and will help you deal with the retirement problems and other financial and legal considerations. This course will also teach you the right communication skills and coping mechanisms to help you assist your aging parents. A high quality life can be provided to the aging parents and a helping hand be given to the beleaguered children with the tips provided by the ExpertRating Helping Elderly Parents Course. In this first lesson, you'll learn a few tools and techniques for effective communication that will sustain you as your Parents age. This lesson will explore ideas that can help you help your parent to maintain his or her zest for life as circumstances change. You'll discover some activities that you might not have thought of before. But you can only suggest that your parents get involved with a new interest. It can be frustrating if they refuse and you have to watch them lose their will to live. My intent is to give you many tools so you can keep trying until something works. If the only behavior you can change is your own, remember that your parent can't help but respond differently to that change. So at least that is in your control. You'll find suggestions on how to make the most of this fact in this lesson. This lesson is going to talk about ways to change how you think about accumulating things. It'll give you some ideas about what to do with the things you and your parents already have once you decide to free yourselves from the burden of excessive possessions. You'll learn about trusts and gifting away financial assets in Lesson 8—for now, this lesson is talking about artifacts and material possessions, the things that fill your rooms, have to be dusted, insured, provided space, and otherwise cared for. In this lesson you'll learn how to protect yourself from the mind control of advertising in this society of getting and spending. At last, you'll have the awareness to control your own spending habits and help your parents start to unload their lifetime accumulation of stuff. People often live under the delusion that they're immortal until something, like a death in the family, reminds them of their vulnerability in this world. They may not even think about what would happen to their cat or dog if they got hit by a bus, let alone how they would like their worldly goods distributed. If you think about your health care wishes at all, it's to hope that you do get hit by a bus and don't have to endure a painful or prolonged decline or death. Advance directives are written documents that serve as an individual's instructions regarding disposal of his or her property. In this lesson, you'll learn what documents you must have, as well as those you should have for yourself and your parents. This lesson will take a close at each of the important documents, and will provide you with tips on how to acquire and prepare them for yourself and your parents with minimum cost and effort. If you're at least 18 years of age, you should have your preferred medical, resuscitation, and funereal instructions officially documented, even if you don't yet have assets to worry about. You'll find out how to address this critical need in this lesson! Even if you think you know your parents inside and out, you might be surprised by some of the things you don't know. And some of those things may be important to you should a parent have to move to assisted living, become incapacitated, or die. This lesson will tell you about some of the things you should find out while you still can. In addition to the documents that were discussed in Lesson 4, you or your parents may have cash, valuables, investments, pensions, insurance policies, safe deposit boxes, a personal safe combination, and account numbers that will be invaluable to the executor of an estate. Do you and your parents have all those things neatly filed in one place? Lesson 5 will cover all that and more. You'll learn about practical and material matters in several of the other lessons in this course. Lesson 6 will take a different tack. Every emotion that there is to experience can surface at some time when you're involved in the inevitable changes that come with aging. This lesson will help you learn what emotions to expect in yourself, your parents, your siblings, and others. It'll revisit some of the communication techniques you learned in Lesson 1 as tools for handling feelings that surface. This lesson will also explore some new applications of pacing and leading, and ways to manage your own emotions. In the past, it was the norm for family to absorb whatever additional burdens came with the declining health and abilities of elders. Community and government services were limited or nonexistent. That's no longer the case. You are not alone, and the good news is that there are services available no matter what financial situation you or your parents are in. This lesson will explore what's available, where to find it, and the levels or progression of help that you may need over time. You'll also learn how to tell when to move from one level to another. After that, this lesson will go over some strategies for handling that moment when you introduce the idea of getting help to your parents. This can be a delicate matter, so it's best to be prepared. Issues of self-esteem and layers of emotion may arise when your parents find that they just can't do all the things they used to. This lesson will teach you to be on the lookout for this as it explores finding help. The home care services you learned about in Lesson 7 can postpone a move to assisted living quarters, but there may come a time when it's no longer feasible for your parents to stay in their current home. You'll learn how to discuss the idea of a move with your parents, and ascertain their preferences, fears, and concerns. There are now several possibilities for increased care or services other than your home or a nursing home. This lesson will describe some common ones. 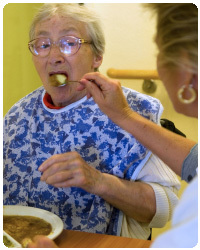 It'll explore the options progressively, from fully independent living to full-care nursing. This lesson will also talk about downsizing, as well as relocation and other services that you may need. Finally, you'll learn to choose wisely if sudden illness or impairment strikes, making a progressive approach impossible. In Lesson 9 you'll learn the five symptoms that reveal when it's time for your parent to move to a nursing home. 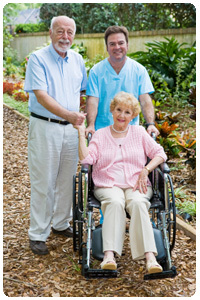 Selecting a nursing home is one of the most important decisions you can make. This lesson will give you criteria and a checklist for selection that will serve you well whether you find yourself in a sudden crisis or just ahead of a parent being released from hospital. You'll be able to use the information in this lesson to enhance your confidence in selecting assisted living or other residence options. When the time comes to move your parent to a nursing home, your behavior can make a big difference in how well he or she accepts the change. You'll have to face the emotions of your parent and other family members, and control your own. The communication skills based on neurolinguistic programming (NLP) that you have learned in previous lessons will serve you well: pacing and leading, gaining and maintaining rapport, and using disassociation to control emotion. Lesson 10 will give you some more tips for applying your skills during this stressful time. Lesson 11 invites you to consider death as a life event, another rite of passage in the ever-flowing river of existence. It'll share much of instructors own experience with her mother's death, and some thoughts that friends and students have shared with her. What you learn will serve you well if you're dealing with the impending death of a loved one. If you aren't yet facing it, the information in this lesson will help prepare you for that eventuality. You'll learn practical tips to help the dying person, and a few more to help you cope. You'll be encouraged to conquer your fear and reluctance enough to be fully present when death is imminent, and this will free you for a profound experience. Lesson 11 talked about ways to handle the experience of a loved one dying. It urged you to choose to be fully present for that experience. This final lesson will address what to expect after the death. You'll become familiar with various theories about grief. This final lesson will also cover some tips on handling issues that might arise. Finally, it'll offer you encouragement and suggestions for getting closure on this life experience, and ideas for getting on with the living.